At 39, the trim, blue-eyed and square-jawed Macron will become France's youngest leader since Napoleon. Like US President Donald Trump, Emmanuel Macron became president on his first run for elective office. France on Sunday shrugged off the siren call of right-wing populism that enchanted voters in the United States and United Kingdom, rejecting anti-EU firebrand Marine Le Pen and choosing as its next president Emmanuel Macron, a centrist political neophyte who has pledged to revive both his struggling country and the flailing continent. The result brought to a close a tumultuous and polarized campaign that defied prediction at nearly every turn, although not at the end. Pre-election polls had forecast a sizable Macron victory, and he delivered - winning some 66 percent of the vote. The landslide was just the latest blow in 2017 for far-right movements that had seemed to be on the march last year but have suffered setbacks in recent months across continental Europe. 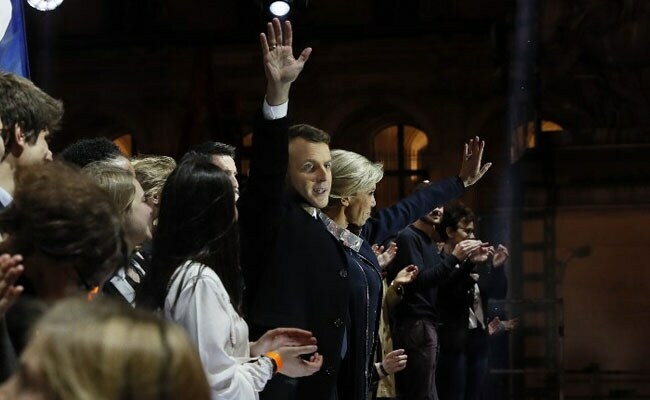 In a pointed endorsement of European unity, Macron strode to the stage at his raucous victory party in the grand central courtyard of Paris's Louvre Museum on Sunday night to the strains of Beethoven's "Ode to Joy" theme, the European Union's anthem. At 39, the trim, blue-eyed and square-jawed Macron will become France's youngest leader since Napoleon when he is inaugurated Sunday, and his election caps an astonishing rise. But by bucking France's traditional parties and launching his own movement - En Marche, or Onward - Macron managed to cast himself as the outsider the country needs. And by unapologetically embracing the EU, immigration and the multicultural tableau of modern France, he positioned himself as the optimistic and progressive antidote to the dark and reactionary vision of Le Pen's National Front. By winning about 34 percent of the vote, she nearly doubled the share claimed by her father, Jean-Marie Le Pen, in the 2002 election, the only other time the National Front's presidential candidate has made it to the second round of voting. The result seemed to cement the party's long march from the political fringe to the center of the nation's discontented political discourse, if not the pinnacle of its power. No matter whom French voters picked, the choice was bound to be historic. The dominant two parties of France's Fifth Republic were both eliminated in the first round. The center-left Socialists were decimated, brought low by the failure of incumbent President Francois Hollande to turn around the economy or to prevent a succession of mass-casualty terrorist attacks. The center-right Republicans, meanwhile, missed what was once seen as a sure-fire bet at returning to power after their candidate, former prime minister Francois Fillon, was hobbled by a series of corruption allegations. 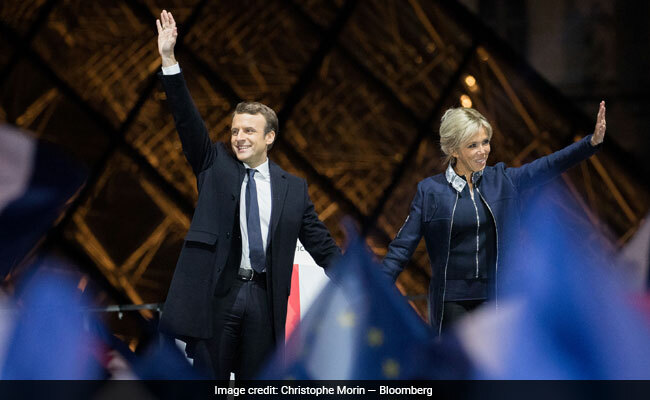 After a pair of dramatic triumphs for the populist right in 2016 - with Brexit in Britain and Donald Trump in the United States - France's vote was viewed as a test of whether the political mainstream could beat back a rising tide. Many of Europe's mainstream leaders - both center-right and center-left - lined up to cheer Macron on after he punched his ticket to the second round in voting last month. The endorsements were a break from protocol for presidents and prime ministers, who normally stay out of one another's domestic elections. But they reflected the gravity of the choice that France faced. A victory by Le Pen was seen as a possible market-rattling death blow to decades of efforts to draw Europe more closely together, with the National Front leader expected to try to take the country out of both the EU and the euro. Former President Barack Obama had also endorsed Macron, and the young French politician often appeared to be trying to emulate the magic of Obama's 2008 campaign with speeches that appealed to hope, change and unity - while eliding many of the details of his policies. The current White House occupant was cagey about his choice, saying before the first round that Le Pen was "the strongest on borders and she's the strongest on what's been going on in France." Trump predicted that she would do well, but he stopped short of endorsing her. After Macron's victory, Trump tweeted congratulations shortly after 3 p.m. Washington time on "his big win today as the next President of France. I look very much forward to working with him!" Macron has almost nothing in common with Trump except one key fact: Like the New York real estate tycoon, Macron became president of his country on his first run for elective office. Instead, he has a movement that he built from scratch, and faces the immediate challenge of getting Onward allies elected to the National Assembly. Despite his victory, pre-election polls showed that most of Macron's supporters saw themselves voting against Le Pen rather than for him. That was reflected on the streets Sunday, with voters even in heavily pro-Macron neighborhoods of Paris saying they felt more resigned than excited. "On the one hand you have a far-right party that will take us straight to disaster," said Gilbert Cohen, a retired 82-year-old engineer who cast his ballot amid the vaulted ceilings of Paris's 17th-century Place des Vosges, a former royal residence that was also home to Victor Hugo. "On the other, you have the candidate who's the only reasonable choice we have." Elsewhere in France, the mood was even more markedly downbeat. In Laon, a small and struggling city 90 miles north of Paris, many voters said they were so disillusioned by the choice that they would cast a blank ballot. Others said their disenchantment had led them to Le Pen - and a hope that, despite the polls, she could still eke out a victory that would bring the radical break for France that they crave. "We've had 50 years of rule from the left and the right," said Francis Morel, a 54-year-old bread maker who cast his ballot for Le Pen. "Nothing has changed." The mood was considerably more cheerful Sunday night at the Louvre, where Macron supporters gathered in what was once the seat of French kings for their candidate's victory party. Valentin Coutouly, a 23-year-old student who described himself as "European to the core," said the campaign had been a whirl of emotion, with anxiety setting in near the end. "I think we were all afraid that Le Pen could actually win," he said. Stanley-Becker reported from Laon and McAuley from Paris. Benjamin Zagzag in Laon and Virgile Demoustier in Paris contributed to this report.